Diggers Valley: 8 September 2012. The week beginning the 8th of September 2012. Stephan has a cold, so I have to do my own work again. Fortunately I'm now feeling well enough to do that. I received word that a certain envelope had been received by some children and that they'd now discovered www.wheresrobot.com, so I spent some time at the computer, answering emails in the name of Robby Robot, corresponding with Stella, as she read through the episodes of his story. She had to email from the bottom of each page, before I'd make the next one available to her. When (if) I obtain her permission to do so, I will publish the correspondence. It was a mixture of hilarious, indignant and very sweet. The two budgies sang their first duet this afternoon. They've been taking turns until now, singing at each other for half an hour at a time, but today the tempo was doubled, and I realised they were doing it together. They're preening each other quite a lot as well and there's a sort of kissy thing going on. I read that the female should be at least a year old before being allowed to breed, so I don't think we'd better provide them a nesting box at this stage. It rained from 2pm, so I didn't go out to the cows until later in the afternoon. I'm moving the cows around quickly now, trusting that the grass will speed up its growth as well; although if the temperatures don't improve soon, that may not happen as quickly as I wish it to. 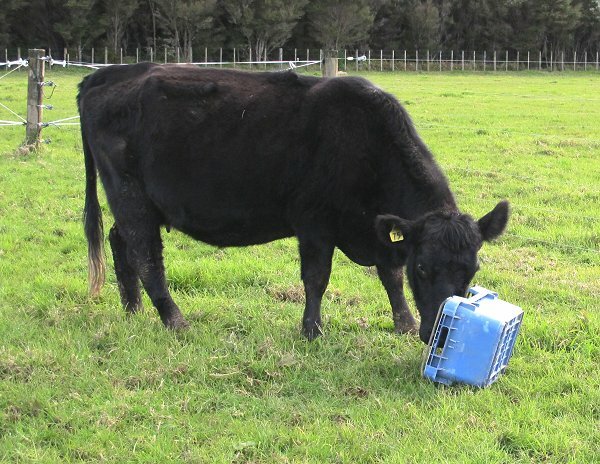 I thought I'd counted my 30 cows out of the paddock and was about to close the spring gate when Eva appeared. She's often late, like her mother, Demelza. 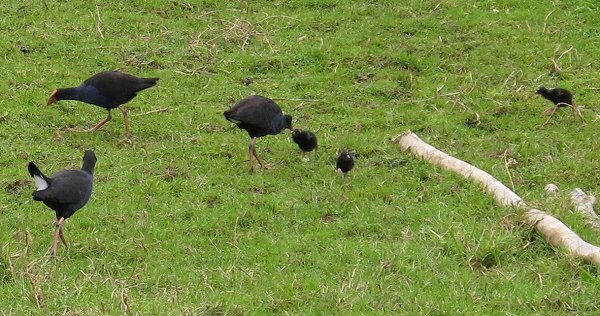 Down on the paddock in front of the house, a family of Pukeko appeared this morning: three parents and five chicks. If we moved in the house, the chicks shot off into the long grass, but if we were sneaky, we could watch them for long periods, being fed by the adults. They generally form groups for the rearing of young. Bush Lawyer, Tataramoa, Rubus cissoides. Bush Lawyer grows all over the place. You always want to find it before it finds you, or it really hurts! 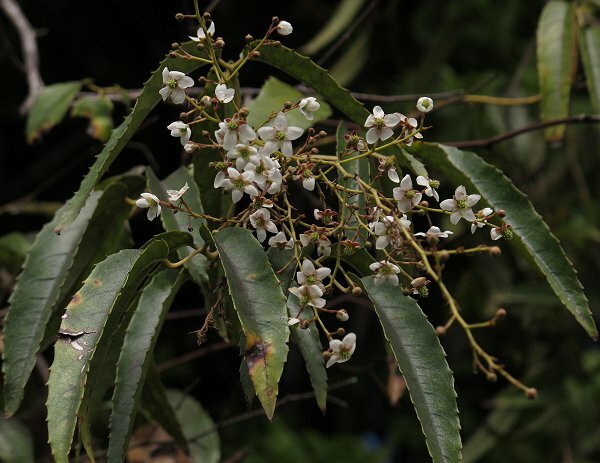 There are hooks along the undersides of the leaves and all down the stems ... It's very unpleasant if it catches your skin. Pretty flowers though. I don't know what this tree is. I thought it was a Maire, but its leaves don't match the descriptions or pictures in my tree books. If you recognise it, please tell me. 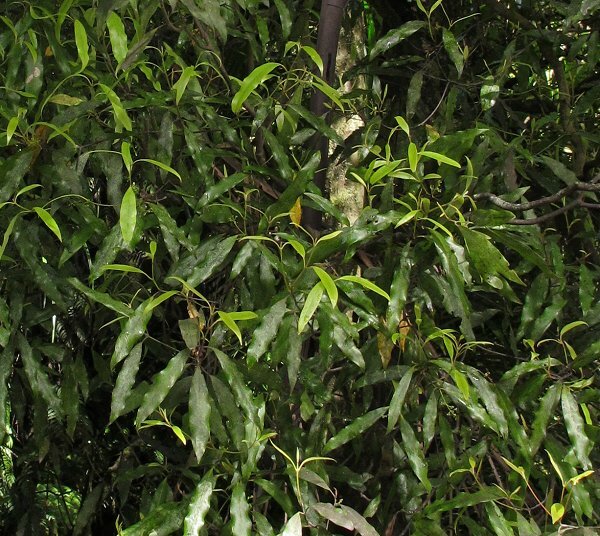 I shall have to get some closer pictures of its leaves and trunk to aid identification. 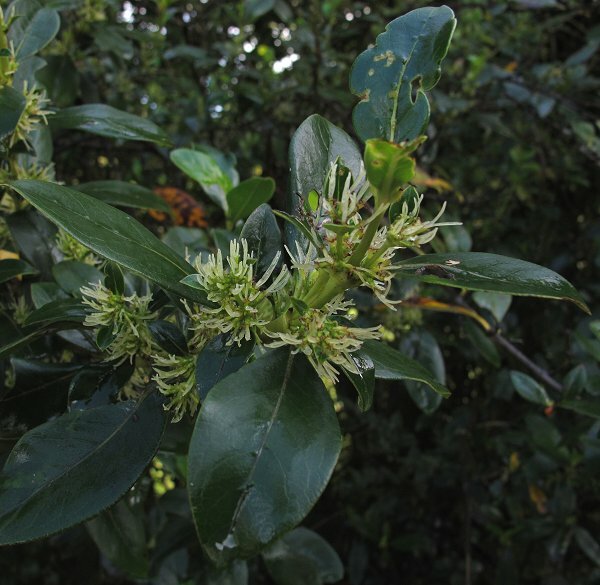 Karam&umacr;, Coprosma robusta, is also in flower; a very common plant. I'm a bit sick of all this wetness and mud. There isn't any ground anywhere that isn't all pugged and waterlogged. It's horrid. The winter hasn't been anything like 2008, the yardstick against which all winters will be measured, but there is about 120mm more rainfall than average lying around, thanks to a wetter-than usual July and a bit more having fallen last month as well. September's rainfall has almost reached the average already, so it is also a wetter month than usual. I went over to Kerikeri today, where the NZQA appears to have settled in holding its training for Exam people. It's a pain because the training takes up most of the day (with travel there and back), rather than only the morning. They don't tell us who else is attending, so I arrived there to find someone with whom I could easily have shared or caught a ride down. The gathering is not really training, just a catch-up on the latest changes to the Exam systems, and an opportunity to discuss with our boss and each other, how to handle problems which crop up during the exam season. I can't tell you in detail what my job involves, because it's all top secret! Not really, but it's not detail I should write about here. If you're curious, email me. 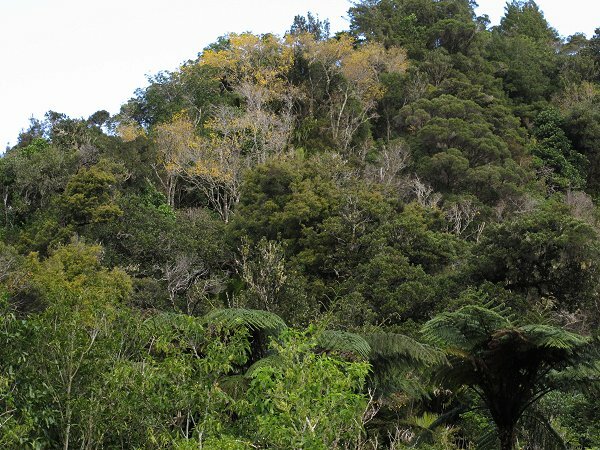 On the way down through the Mangamuka Gorge I looked to see whether the Kowhai trees were flowering and on the way home stopped to take some pictures. They always make me feel like spring has arrived. Another cheery yellow flower, but one I hope we never see at our place. 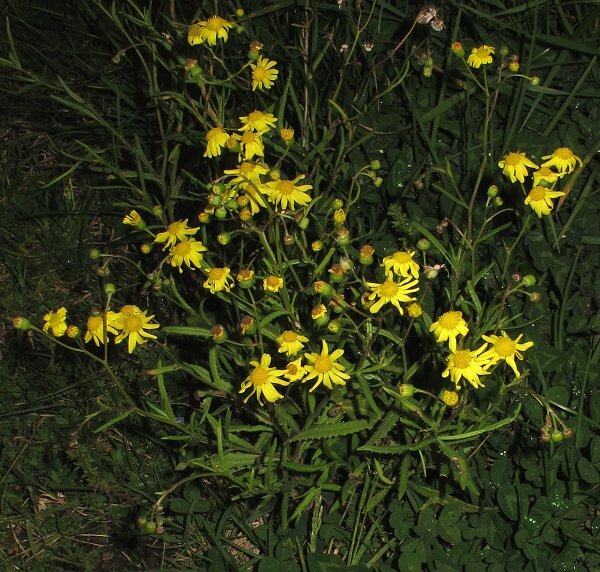 This is Gravel Groundsel, Senecio skirrhodon, growing on the side of the main road down at Victoria Valley and it is spreading. The plants are now growing on the other side of the road from the area I first saw them last year. It's marching toward us and nobody's doing anything about it. 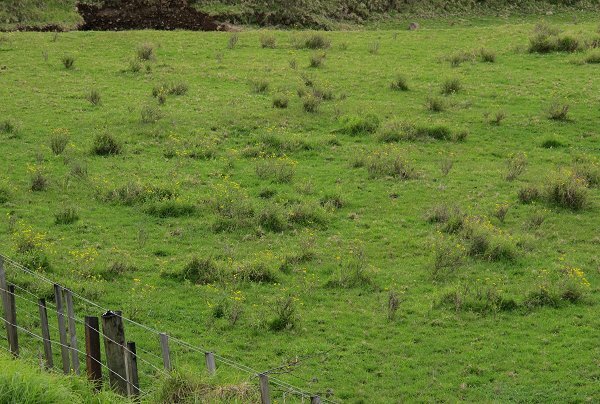 There is no way, apparently, to make the guy whose paddock it's growing in, stop it from spreading out. Stupid, stupid, stupid. 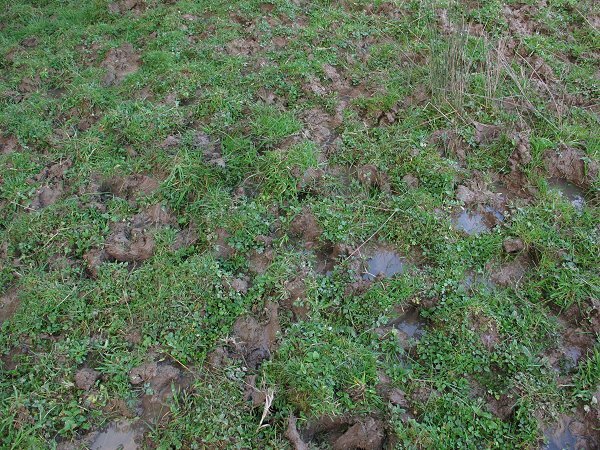 This is what pasture looks like when the animals avoid eating the toxic plant. This property is the one from which our first lot of river metal came. It wasn't until last year that I heard this was also where Gravel Groundsel is actively growing (it's widespread further north and creating a real problem for the farmers there). I can't find the pictures I'm fairly sure I took at the time, but I have a strong feeling I pulled a lot of little plants like these out of our track in the months after the gravel had been spread. I recognised them as something I'd not seen before and so eliminated them. I am very glad I did. There's a slight chance there could have been some in places I have not had occasion to wander, since a little of the river gravel was spread near one of our own streams. I suspect it's a weed we're just going to have to contend with as best we can, just as we do with its cousin, Ragwort. 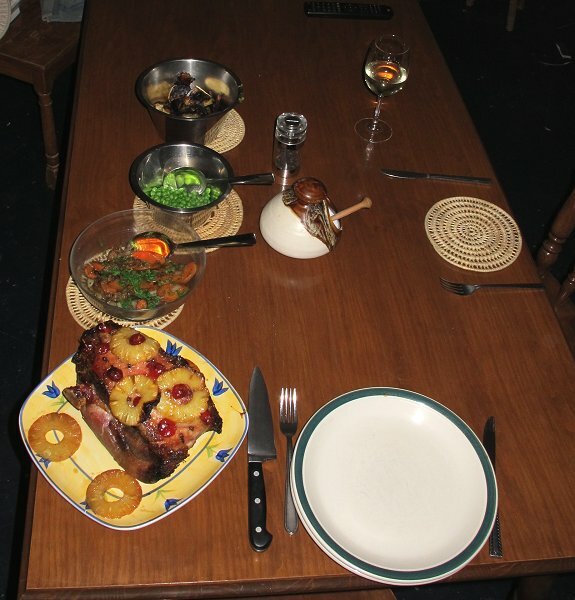 Stephan cooked me a birthday dinner: glazed ham with roast vegetables. It was all delicious, especially the ham. This is one of the many hams we had done from the last pigs and it's very good. I really like good ham! The cows look ok from this angle and distance, but some of them are a bit thinner than I'd like. This hasn't been a particularly easy winter. Riding home along the track I noticed the head of a fallen Cabbage Tree against the Flax, where it shouldn't be. The tree has snapped off at the base and a quick look provided no idea why. The 14 plants I originally planted here had all grown well until now. I note that my original post says there were 15 holes dug, but I'm pretty sure there have always only been 14 plants. Stephan took me down the road to have a lovely massage this morning. My plan was to come home and enjoy the after-glow of that relaxing experience, eat birthday cake and generally have a quiet sort of day. As we came home we discovered a couple of our neighbours were out on the road. 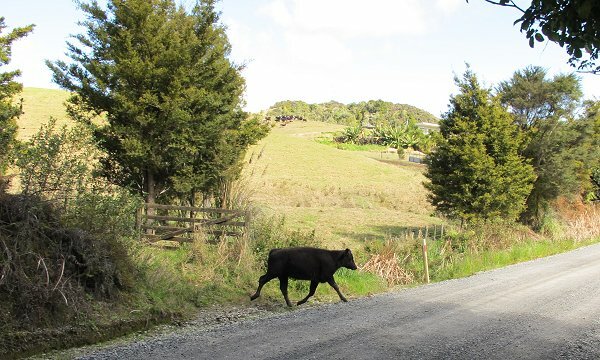 One of that mob of young grazing animals on the property next door to our Over-the-road paddock, had got out onto the road again and they now didn't know where it had gone. I was pretty sure I did. We spent the next hour getting our cattle off the hill and then the stray animal headed back along to the far end, where it had somehow come in. After the last animal got into the paddock Stephan had modified the railings where it got over and into the paddock, but today we couldn't see where the animal had gone over the fence, although there were footprints to show where it had been on the road side. 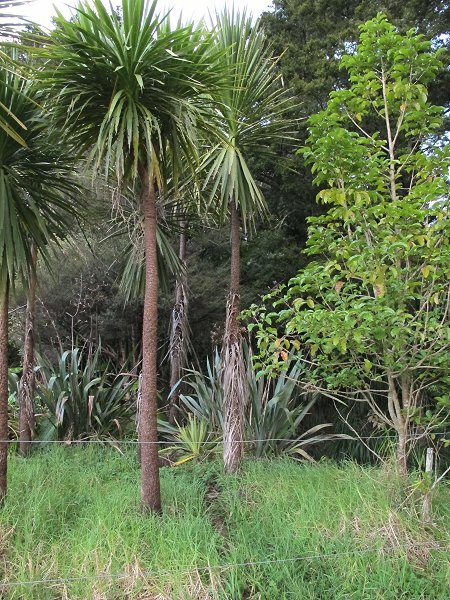 We opened the gate for the owner, who first sent his two dogs up the hill to chase the animal down, which only upset it so it ran into the trees, then he drove his quad up the slope and spent several minutes chasing the animal around and around a Totara tree. Why he didn't quietly walk up and around it and propel it back down to the gate, where it wanted to go anyway, I can only guess. My guess is he has no stock sense at all. I am really annoyed about this, being the second time exactly the same problem has occurred. 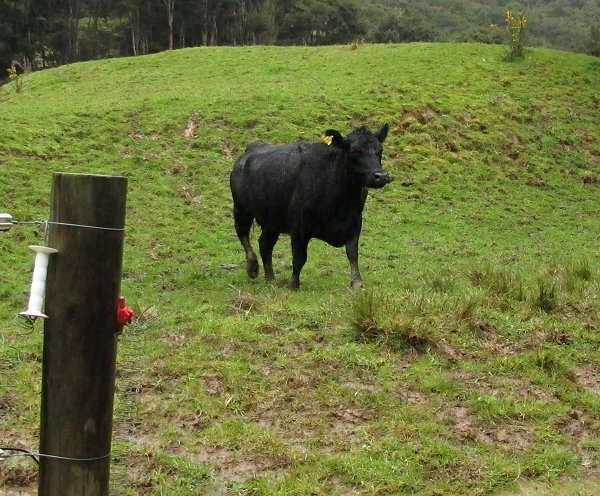 Why neither the animals' owner nor the owner of the land they're grazing has done anything to upgrade the fence where they get out, I do not understand. If something happens once, it's a problem you fix; if it happens again, that's not an accident, it's negligence. I told the guy that I want him to tell us when he's got the animals back at his place, with access to a race where Stephan can go and take blood from the steer in question. It's too late for us to muck around waiting to blood test all our animals again, so I want to know this one's BVD status and its owner can pay for the testing! I hope he follows through, having agreed to that request. I've only just received the bill for testing the nine animals last time: $205 in laboratory fees alone. I have to hope that my animals' exposure to the stray steer was so brief the chance of contagion is very low; I can't hold them separately at this stage anyway, now that calving is so close. In the afternoon I gave them their third copper shot for the winter, pulled these two (571 and 660) out and sent the other seven back over the road to the end furthest away from the neighbour's cattle. These two are due, according to my calculations, on 21 and 30 September, and today they had their first Molasses and Magnesium. There was a commotion beside me as I stopped to open a gate in the lane this morning. 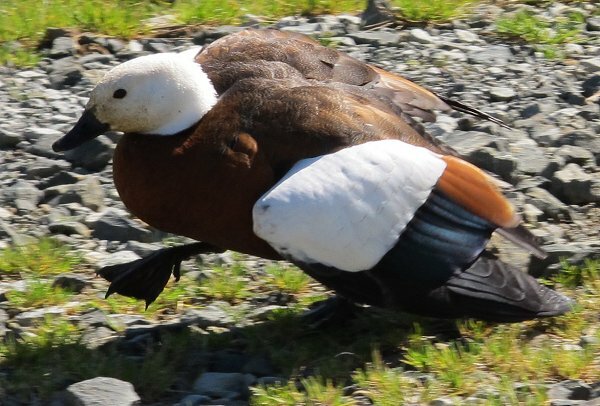 A Putangitangi (Paradise Duck) male flapped out of the drain onto the track and hobbled, dragging his wings, along the track trying to entice me to follow him. Naturally I looked back to where he'd come from, knowing what he was up to! 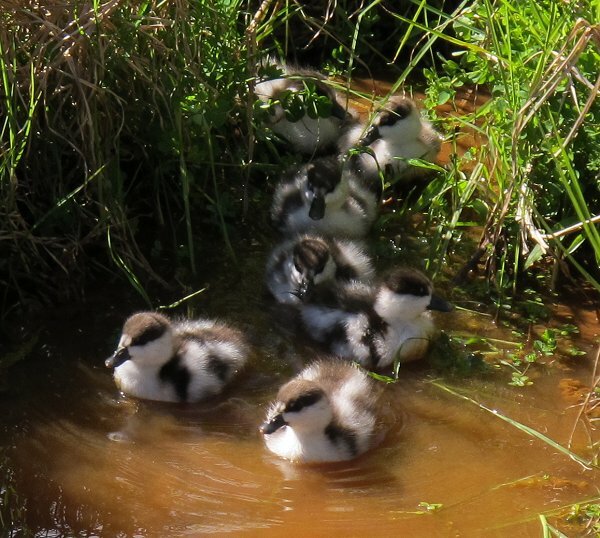 The mother duck scrambled out the other side of the drain and then this clutch of ducklings came tumbling out of the long grass and into the water, cheeping constantly and unaware of any danger. Mother duck gave a great theatrical rendition of a wounded duck I'd need to follow. The parents gave up trying to lead me away and, continually calling their youngsters, ran quickly off down the track away from me and that's the last I've seen of them. It doesn't surprise me that I haven't seen them again. 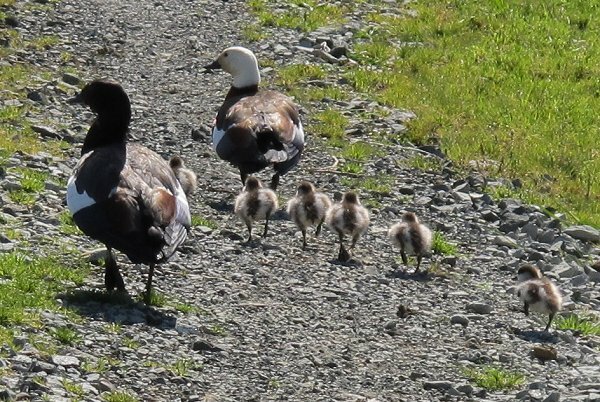 They're very secretive with their young and I lived here for several years before I ever saw any Putangitangi chicks. 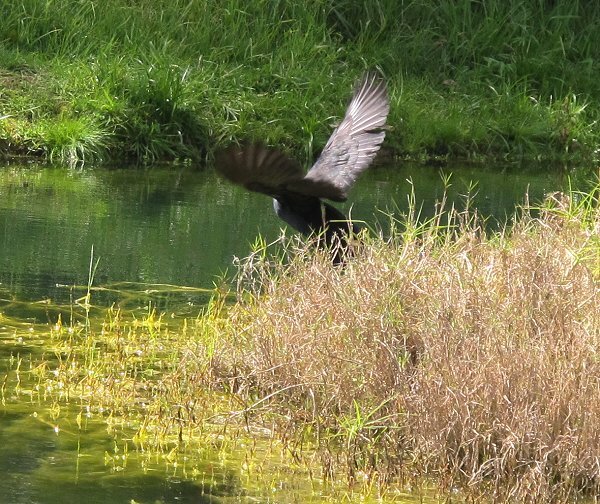 A movement on the island in our pond caught my eye later in the day. 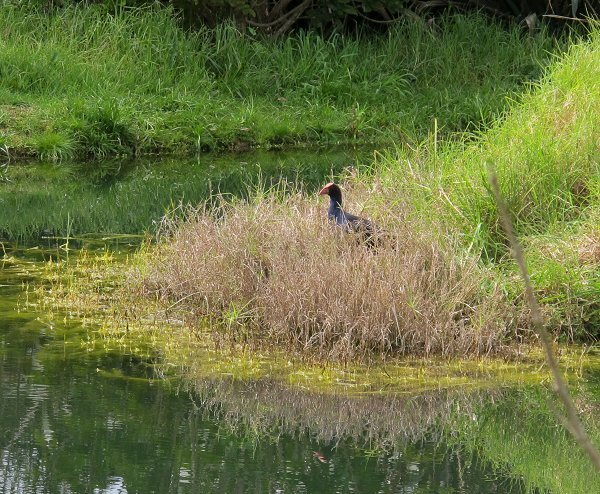 This Pukeko spent several minutes grabbing dry grass and carrying it over to a nest it had just begun forming. I checked a couple of days later and could see no evidence of further work on the nest, nor have I seen the bird there again. 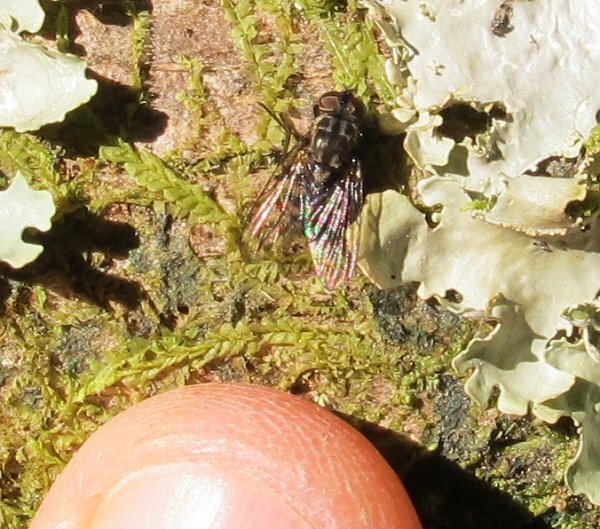 More flying things: a number of tiny flies were hanging around a Puriri tree trunk as I was looking for orchids this afternoon. I don't recall seeing these before, so took some pictures. They seemed unconcerned about my proximity, which helped with the photography. 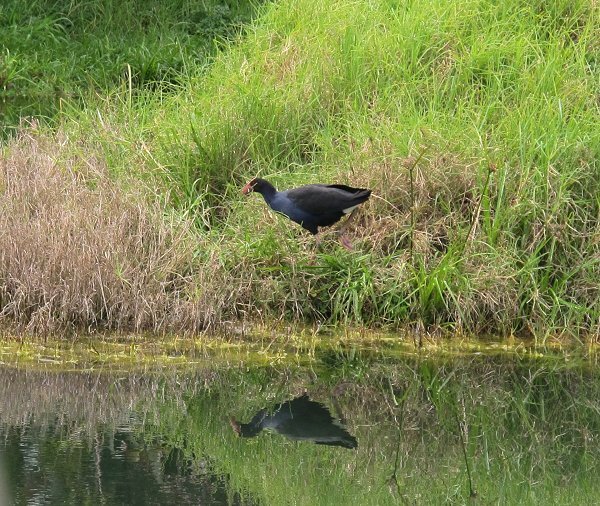 I sent the pictures off to my helpful contact at Landcare Research who told me they are "an undescribed species, though it seems to be fairly common around Auckland. 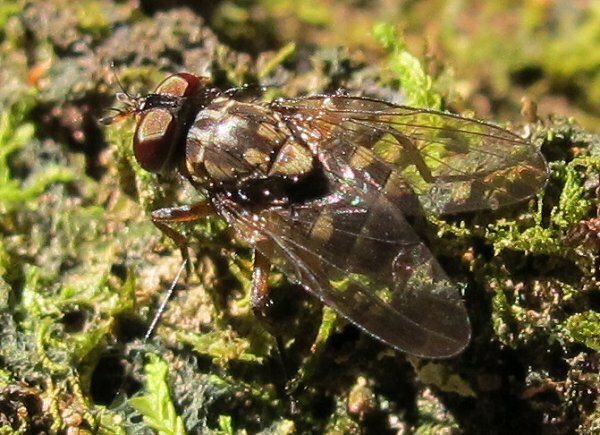 It is in the Muscidae family - same family as house flies." They are probably a native species. I gave the cows their third copper shot today, all very quietly through the yards, trying to make sure nobody got bashed by anyone else in the process. I watched some very violent calf kicking from inside some of their bellies! Looking at the pictures of the cows, the cows themselves and comparing them with pictures from last year, I have to acknowledge that they're not in as good condition this year as last. 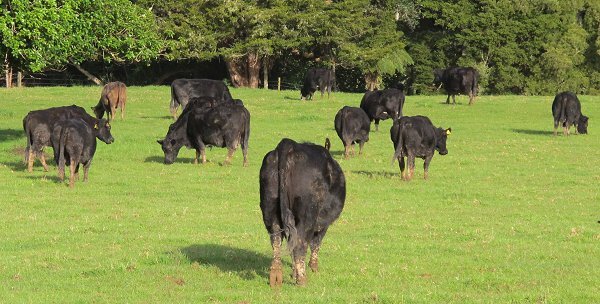 The thin cows are as thin as they were then, and some of the better-conditioned cows are not as good as they were approaching calving last year. 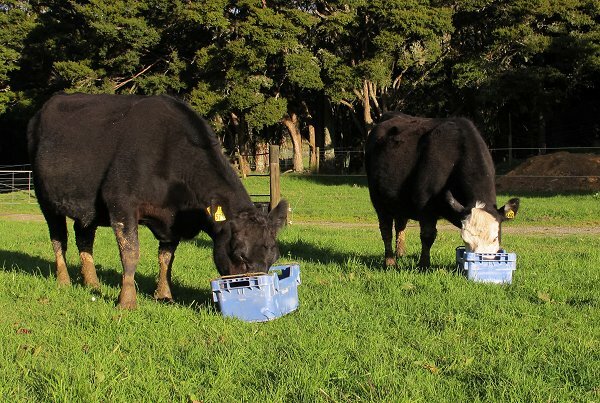 Farming without supplementary feed is a tricky business!